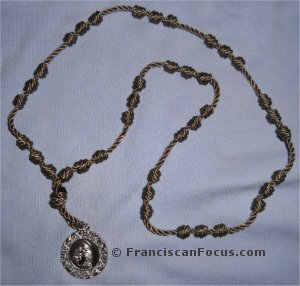 Franciscan Focus: St. Anthony Chaplet: Make it, pray it! One of my Secular Franciscan sisters has a devotion to St. Anthony, and so I decided to make chaplet for her. I actually didn't know if such a chaplet existed beforehand, but figured I'd do a search and lo! It does indeed! Thank you, Interwebs! So I figured I'd share back with the Interwebs. Here's a picture of the chaplet I recently knotted up, along with information on how to pray it. I made this with solid brown twine, and finished it with a spiffy St. Anthony medal. As for the amount of twine used, it was about 3/4ths needed for a standard 5-decade Rosary (19-1/2 to 20 feet), which works out to about 15 feet. 1st Bead: One "Our Father"
2nd Bead: One "Hail Mary"
3rd Bead: One "Glory Be"
St. Anthony, who raised the dead, pray for those Christians now in their agony, and for our dear departed. St. Anthony, zealous preacher of the Gospel, fortify us against the errors of the enemies of God, and pray for the Holy Father and the Church. St. Anthony, powerful with the Heart of Jesus, preserve us from the calamities which threaten us on account of our sins. St. Anthony, who drivest away devils, make us triumph over their snares. St. Anthony, lily of heavenly purity, purify us from the stains of the soul and preserve our bodies from all dangers. St. Anthony, healer of the sick, cure our diseases and preserve us in health. St. Anthony, guide of travelers, bring to safe harbor those who are in danger of perishing and calm the troubled waves of passion which agitate our souls. St. Anthony, liberator of captives, deliver us from the captivity of evil. St. Anthony, who restorest to young and old the use of their limbs, obtain for us the perfect use of the senses of our body and the faculties of our soul. St. Anthony, finder of lost things, help us to find all that we have lost in the spiritual and temporal order. St. Anthony, protected by Mary, avert the dangers which threaten our body and our soul. St. Anthony, helper of the poor, help us in our needs and give bread and work to those who ask. St. Anthony, we thankfully proclaim thy miraculous power, and we beseech thee to protect us all the days of our life. let Padua on her patron tell. and may deserve to possess eternal joy. Thank you for this St. Anthony Chaplet. I also have a devotion to St. Anthony.